We thank Leslie Norman Gabriel for donating the following material to ARCHIVES Project. "California MUFON Radio Highlights Michael Horn’s Presentation of the Alien Encoded Pictographs Channeled Through Billy Meier, part Deux. Later on Wednesday, August 20th at 11 pm EDT, the genial prolocutor and voice of California MUFON Radio, Lorien Fenton, looks for savvy researcher Michael Horn to underscore the true relevance of alien communication with mankind through the works and prophecies of the controversial alien contactee Billy Meier. MICHAEL HORN is the Authorized American Media Representative for the Billy Meier Contacts (www.theyfly.com), which he has researched since 1979 (and proved to be absolutely authentic). He is the writer and producer of the new, award-winning feature length documentary, “The Silent Revolution of Truth”, as well as the writer, producer and narrator of the DVD “The Meier Contacts – The Key To Our Future Survival”. Michael has concluded that Meier’s credibility is unequaled by any other source, past or present. Tune in on Wednesday at 11 pm eastern as Lorien analyzes all facets of Billy’s claim and weighs the preponderance of evidence presented by Michael Horn, right here on the Inception Radio Network." We are very glad to announce you that Research Professor Emeritus(OSU) - James W. Deardorff has sent us a 4th and final box of Meier case material with postage fees already paid at his end with $ 62.65, which was received on Aug 6, 2014. See below for the list of material. 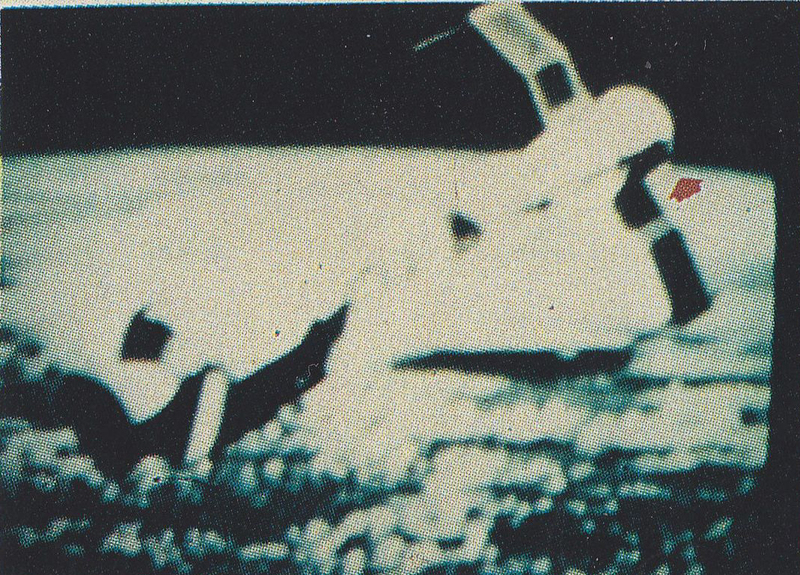 Billy Meier with the help of ET-Ptaah (who "strictly ensured" that only Meier's genuine or almost genuine pictures gets published in PPKB 1), publishes the following 7 photographs of Apollo-Soyuz docking event and/or satellites of terrestrial or extraterrestrial origin (see CR 31, July 17, 1975, Semjase verse 65). Before we analyse all the above 7 photographs one by one, though not in an orderly fashion as arranged above, let me a present a list of spacecrafts & space stations that were in space during July 1975, compiled according to this wikipedia page. This was the Apollo, sometimes referred to as Apollo 18, though this wasn’t an official name, that was involved in the Apollo Soyuz Test Project (ASTP), a joint venture between the US and USSR (Russia) to dock two spacecraft from both countries with each other in space. 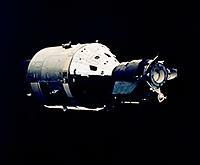 Apollo would dock with the Russian craft Soyuz 19 on July 17, using a special docking module (DM) to make this possible. Allegedly one of the objectives of the Great Journey of Billy would be to witness and photograph the docking between the two spacecrafts. This is the specially designed Soyuz 7K-TM craft that would dock with the Apollo. 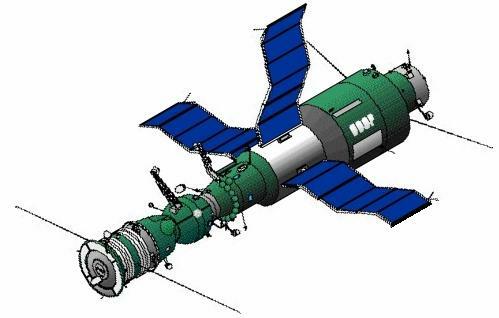 A Russian space station that was part of the Salyut programme. It was launched on December 26, 1974 and re-entered on February 3, 1977. It was docked with Soyuz 18 from May 25, 1975 to July 24, 1975, which covers the time the Great Journey took place. A Soyuz 7K-T type spacecraft that was docked with Salyut 4 from May 24 to July 26, 1975. The first US space station. During the Great Journey, it was unmanned however since the last manned mission to Skylab (SL-4) left on February 8, 1974. 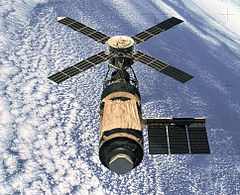 Skylab would re-enter on July 11, 1979. Now back to Meier's outer space photographs. An unidentified spacecraft(s?) 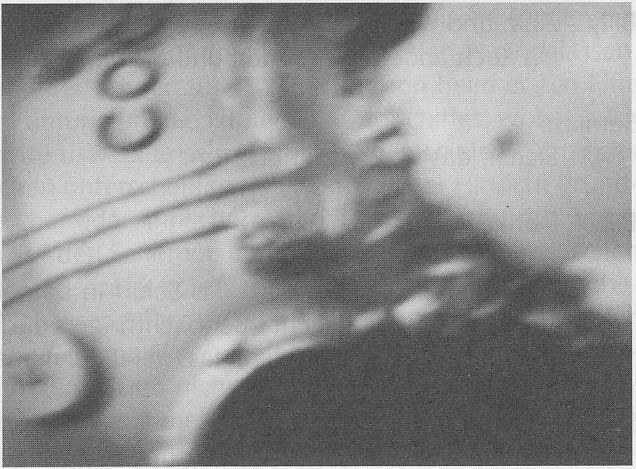 in the below half-part of the image (foreground) and a classic-flying saucer contour on the top (background) which might represent the craft which Semjase says belongs to her race. And the four circular dots of light near the left edge of the image could be representing the four other extraterrestrial ships that according to Semjase were foreign to them and were only there to observe the historic Apollo-Soyuz docking event (see verses spoken by Semjase between 43-44 in CR 31). The object in the foreground seems to be a booster of some kind, but I have not yet been able to identify this craft. This simulation video shows something similar but not identical at 0:57 seconds. From what I know, it doesn't at all resemble any otherspacecraft & space station - Apollo 18, Soyuz 18, Soyuz 19, Salyut 1 & Skylab - that were in space in July 1975. I have written to some people who run aerospace related websites & obviously knowledgeable on this topic and even they have failed to identify the object in the image. This clearly resembles the Soyuz spacecraft that has already been analysed in Part 2 and concluded to be nothing but a model from a NASA animation broadcasted all over the world in early 1970's. But Meier & his supporters could still claim that the Soyuz spacecraft in the above image was not the Soyuz-19 that docked with Apollo CSM on July 17, 1975 but could be other Soyuz orbiting at that time around the earth. The only Soyuz other than the Soyuz-19 that was in space during the time of July 1975 was Soyuz 18, whose mission started (launch date) on May 24, 1975 and ended (landing date) on July 26, 1975. But the design of Soyuz 18 (see below) is very different to that of Meier's Soyuz (MS). One main difference, being that the Soyuz-18 doesn't have the solar arrays/panels at all since the spacecraft was intended to ferry crews to and from space stations, rather then for extended, independent flight, designers chose to remove the solar arrays. Battery power alone would be sufficient for the short flight to and from the station. 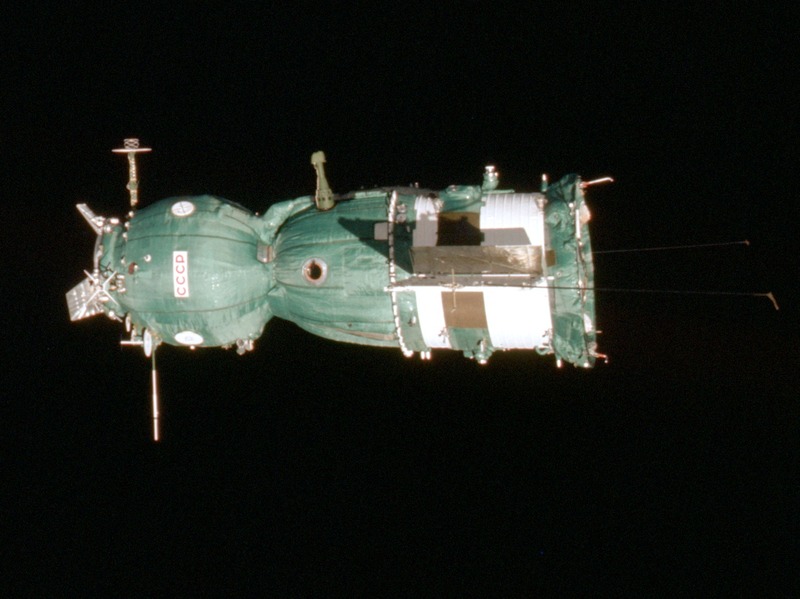 While docked to an orbiting space station, the Soyuz Ferry would draw power from the stations electrical system. The other main differences are the aerials & the docking system. Is this at least a real Soyuz-19, photographed by Meier ? It is not a real Soyuz-18 (which was also in space at that time) either because of clear differences that can be noticed with the aerials on the orbital module (OM), solar panels (Soyuz-18 has no panels, see the drawing of Soyuz-18 in Photo #2) & docking system of both spacecrafts. Now as to why it is not real Soyuz-19, compare the above Meier's picture with the below real Soyuz-19 taken from Apollo-CSM in July 1975. One clear difference is that the solar panels & antenna's in MS were not extended but retracted (which looks like this) or in the process of extending. Real Soyuz-19 was launched on July 15, 12:20 UTC, 2 days before the Great Journey started. The solar panels and aerials should already have to be in extended configuration by July 17, since these would be immediately extended when it reaches the orbit after it's launch. 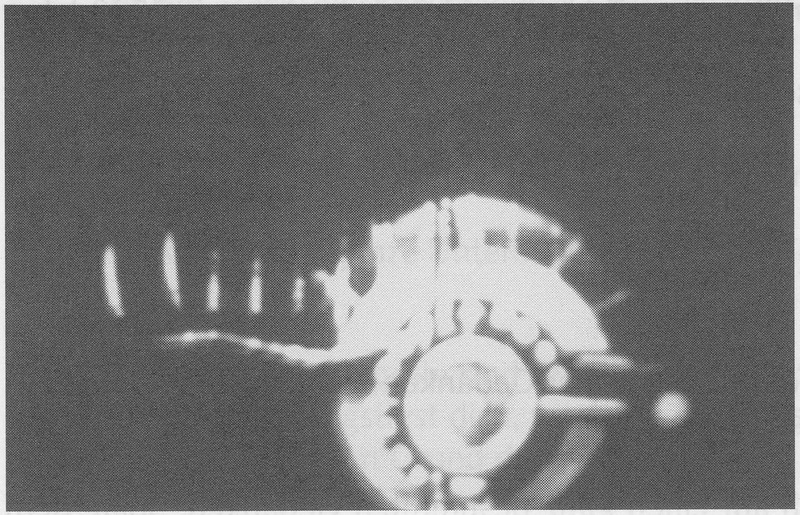 This MS picture could not have been taken from the Apollo either, since the solar panels of Soyuz 19 were deployed & extended when it approached the Apollo craft, as can be seen in the real pictures here. 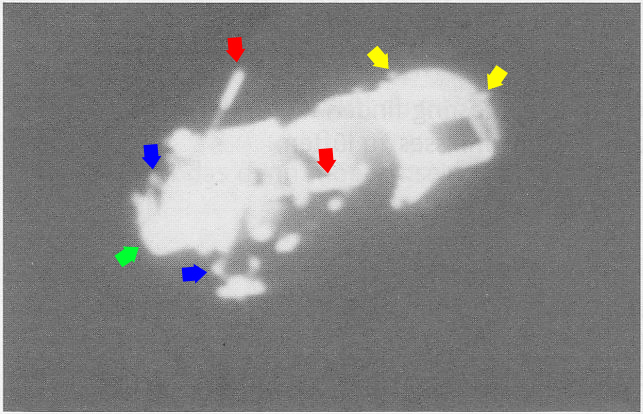 Comparing the components (arrows) of the spacecrafts in both images reveals that MS & RS are aligned similarly though the MS was facing towards its right with respect to the camera. 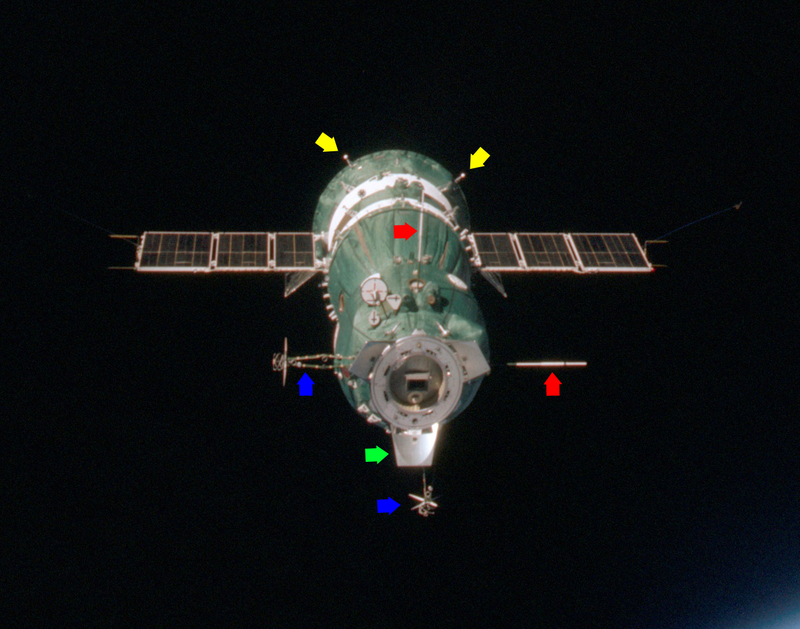 Close observation shows that the position of one of the "flaps" of docking system (green arrow) with respect to the bottom antenna (pointed by blue arrow) is different in MS. These differences shows that the MS is definitely not the real Soyuz-19 but likely was either from an animation or from an illustration or from a real photograph of a mock-up model. Apollo CSM during ASTP ? Meier's picture seems to be showing an Apollo CSM (Command/Service Module) over the horizon with no docking module. Is this at least a real Apollo, photographed by Meier ? See the below picture showing a real Apollo CSM as photographed from real Soyuz-19. The only Apollo craft in space during the Meier's Great Journey (July 1975) was the Apollo-Soyuz Test Project (ASTP) Apollo, sometimes referred to as Apollo-18. However, a special docking module (DM) was attached to Apollo-18 to make the docking with Soyuz-19 possible, which is clearly not present in the Meier's picture. During the launch (by a Saturn 1B rocket), the DM was placed behind the Apollo craft, just like the Lunar Exploration Modules (LEM) were during the launch of the moon missions. Once in space, the Apollo would separate from the upper stage, turn 180 degrees, dock with the LM and extract it from the upper stage, as can be seen in this simulation video. The same procedure was followed with the DM. During ASTP this procedure took place on July 15, 21:04 UTC (= 22:04 CET, which is the time in Swiss). This was two days before the Great Journey began, so this picture cannot have been made during that procedure. After the docking with Soyuz, which took place on July 17, 16:09 UTC (17:09 CET), and the final separation, which took place on July 19, 15:26 UTC (16:26 CET), Apollo released the DM on July 24, 19:41 UTC. 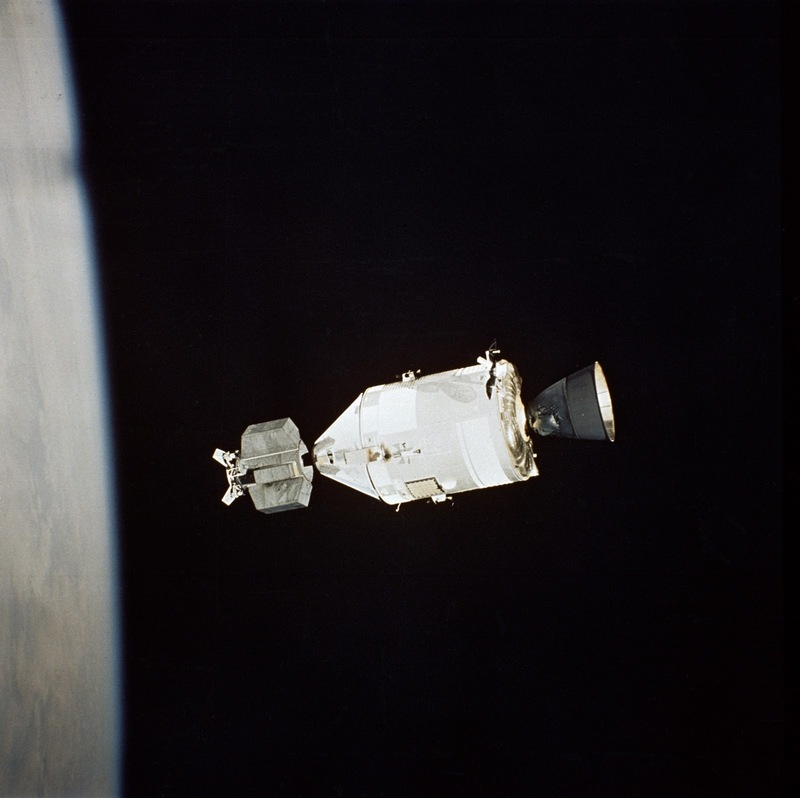 The Service Propulsion system was fired at 20:37 UTC and the landing took place at 21:18 UTC, which leaves a window of about an hour in which the above picture could have been taken, not even considering the position of the Apollo craft with respect to the earth. Did Meier perhaps photograph Apollo on July 18, when he time travelled back in time after his Great Journey was over on July 22 ? As mentioned earlier, Apollo was still connected with DM during the entire time period between July 17-24. Moreover, Meier didn't mention such an event in his contact notes. In conclusion, this picture could not have been taken during the Great Journey. The likely source of this picture is not the Great Journey, but rather a copy of another picture (for example taken from a LEM during any moon mission) or animation of an Apollo craft mission. I have not (yet) been able to find a resembling picture. A somewhat similar frame is seen in this video at 3:28 min. This Meier's picture shows part of the orbital module (OM) and the descent module (DM) of a Soyuz spacecraft. On the OM part, the word СОЮЗ (is in Russian script, pronounced 'Soyuz' in English & the meaning is Union) is readable. Also three parallel conduits are visible, as are some other features, which brings us to the main objection for this photograph. Soyuz-19 & even Soyuz-18, and all Soyuz's that were launched before 1975 and after 1975 has - as mentioned in Part 2 under the differences between real Soyuz-19 & Meier's Soyuz - a green (or a tint of green) thermal insulation blanket covering most of the spacecraft. So, the conduits and other features present on the hull of the spacecraft would be invisible, including any script (СОЮЗ). For example, the only visible script on real Soyuz-19 as shown below is 'CCCP' (is Russian & means 'USSR' in English). And this script is on the OM (first part of Soyuz from left) but not on the DM (middle part of Soyuz), which is the case with MS. Observation of the real or close-to-real mock-up models in museums & illustrations, reveal that there is no other script on the hull, except that is shown below. Also any black & white picture of a rich green fabric, would appear as dark grey and not white as seen in Meier's picture which reveals that the color of the body is white. So where could the Meier's picture come from ? Most likely, the simple answer is that the picture could be taken of a mock-up model. Since almost all mock-up models, displayed in museums or aerospace trade shows are not covered with green fabric because it is intended for visitors to observe the crafts details & components on the hull of the spacecraft. The features as shown in the black & white Meier's picture are very identical to the features in the following picture of a mock-up model of a old Soyuz second-type spacecraft, which was shown on a Paris Air show at Le Bourget Airport, in early 1970's. 47. In time you will understand my words... but don't you want to look inside the capsule? How would that be possible, the crazy thing is totally closed and made airtight. 48. You don't know the possibilities of our technology, which allow us to distort all matter by radiations so that it becomes invisible to the eye. 49. We are able to do this in a very controlled manner and can thus steer the effect very precisely . Then let me see your magical technique. However, as interesting it may be to look inside the space craft, there seems no apparent reason to only make the insulation invisible to photograph the hull, rather than the cosmonauts inside. Since we have already discussed much on Apollo & Soyuz spacecrafts, we have become familiar with both of their designs, size and proportions. With this gained knowledge, a look at the above Meier's photograph reveals that it is so much different from both Apollo & Soyuz. Could it be an extraterrestrial satellite which Semjase mentioned (in verse 65, CR 31) that Meier could photograph after Apollo-Soyuz docking event ? Because anyone with a little knowledge on spacecrafts would easily recognize what is present in the above picture, allegedly taken by Meier and strictly verified by ET-Ptaah. Since I do not have much knowledge about spacecrafts, at first I thought that the vertical "strings" seen towards the left in the image could be the supporting strings used to hold a model spacecraft usually set for display in a museum or at some aerospace trade show, like this one here, with the old Soyuz model. Not being satisfied with the inconclusive results, I tried to find what other spacecrafts, satellites or space stations were in space during July 1975. We have already discussed that Apollo, Soyuz 18 & Soyuz-19 were in space at that time. Apart from these & the Skylab space station (which do not match with the one in Meier's picture), a Soviet space station - Salyut-4 - which looked similar to the one in Meier's picture, was in orbit, launched on December 26, 1974 and later was deorbited on February 2, 1977, and re-entered the Earth's atmosphere on February 3, 1977. However, during the Great Journey in July 1975, Salyut 4 was docked with Soyuz 18 (May 25, 1975 – July 24, 1975), making this picture of the docking port impossible (unless Semjase would have made the Soyuz-18 craft transparent!). Furthermore the configuration (regarding the solar panels etc.) of this Salyut 4 was considerably different to that in Meier's photograph. Even though it came close, Salyut-4 didn't quite match the object in Meier's photograph. Finally after searching a lot on Salyut space stations, I have found an exact match which is 100% identical to that of Meier's. The source is a Russian space documentary Крутые дороги космоса (Steep roads of space) produced in 1972, which contains remarkably identical frames at around 12:22 min, as seen in the Meier's picture, though appear in a 180 degrees counter-clockwise rotation. 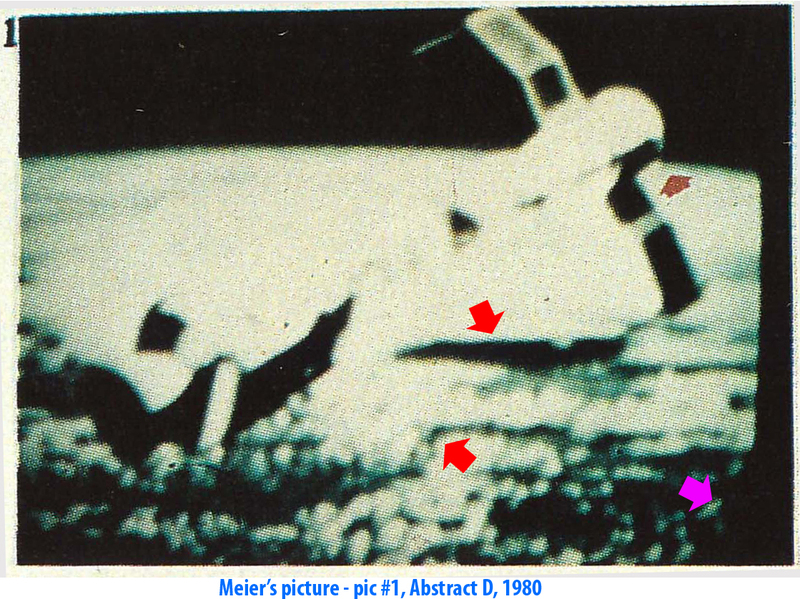 Each & every structure and component in Meier's photograph matches 100 % with the frame from Russian 1972 documentary, even the angle of curvature visible on the first two "lines" from left (circled red). Even the image shown in the documentary is not the real Salyut-1, but a replica used in a simulator to train cosmonauts on the docking procedure and the "lines" are actually the grids on the screen of the simulator. Docking of Soyuz-Soyuz spacecrafts ? From the knowledge on the size and design of Soyuz spacecrafts so far gained from our investigation, it becomes clear that the two objects seen in the above photograph are two Soyuz spacecrafts docked with each other and a spear-shaped antenna is also visible above the left-Soyuz. 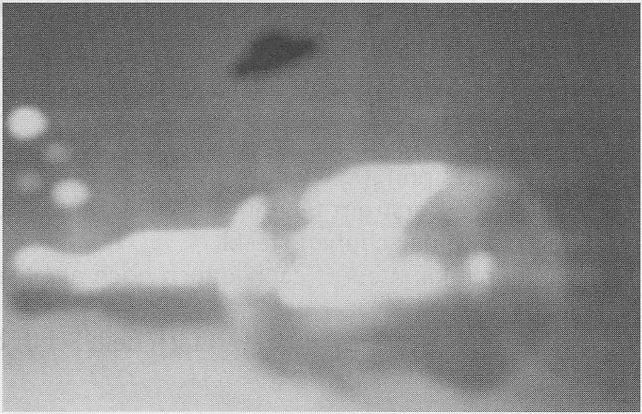 Is this at least a real image photographed by Meier on July 17, 1975 ? 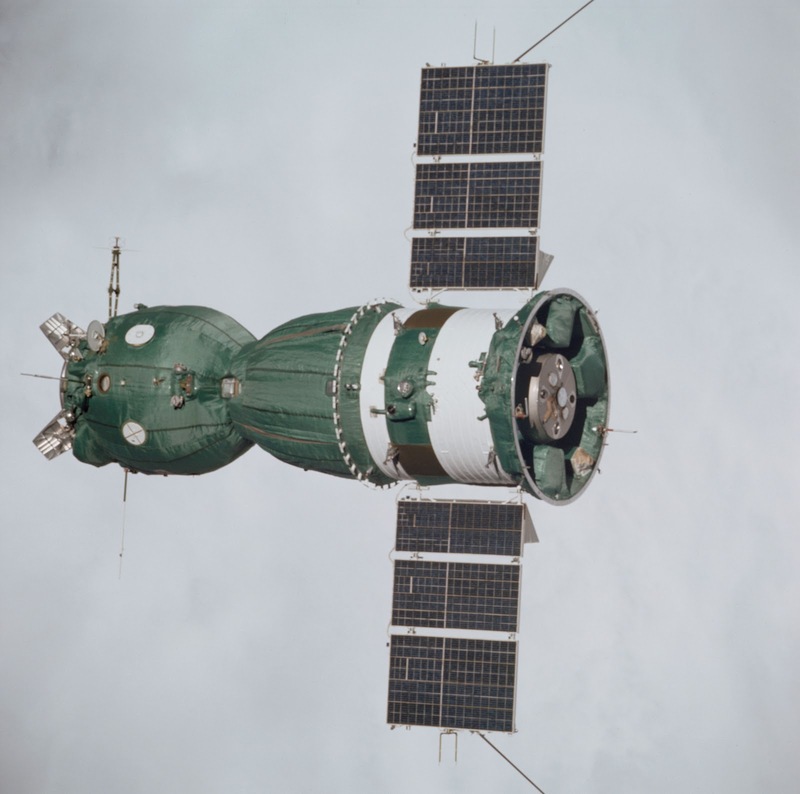 The only Soyuz crafts in space during the Great Journey (July 1975) were Soyuz 18 (docked with Salyut 4) and Soyuz 19 (involved in the ASTP), which obviously did not dock with each other. Also the features on the Soyuz crafts in the picture are incompatible with both Soyuz 18 and Soyuz 19. Soyuz 18 (see Photo #2) was a Soyuz 7K-T model craft, which had no solar panels at all, but long aerials instead. Soyuz 19 was a special design for ASTP (a Soyuz 7K-TM model). Were these perhaps spacecrafts of USSR launched secretly without the world knowing about it ? Again, the answer is simply NO! Identical images of Meier's photograph are seen in the same simulated animation (seems to be with miniature models) shown in two Russian space documentaries (one of which, we have already mentioned in Photo #6) - Первая орбитальная (20:53 min, 1969) and Крутые дороги космоса/Steep roads of space (35:09 min,1972). The only time in history, the two Soyuz crafts ever docked (see this list of Soviet manned space missions) in space was on January 16, 1969, more than 6 years before the Great Journey supposedly took place in July 1975. The involved crafts were Soyuz 4 and Soyuz 5. 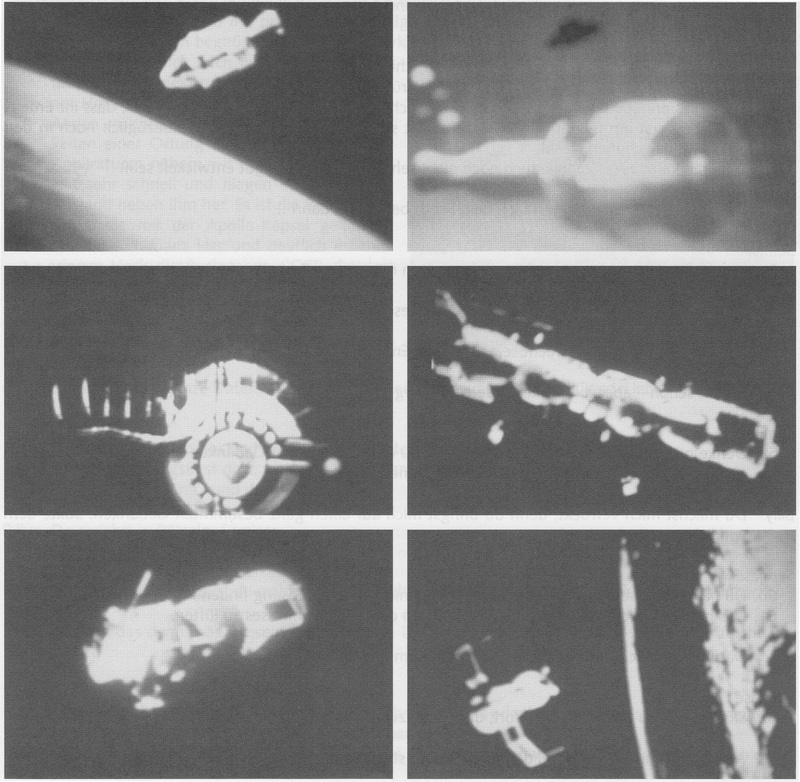 Another attempt was made between October 11 and 16, 1969 by Soyuz 7 & Soyuz 8, and this was to be filmed by Soyuz 6, but the mission failed because of failing rendezvous systems on all the 3 crafts. I have pointed out just five easily noticeable similarities and since both images are virtually the same, it is redundant to point every similarity. So finally what do we have are photographs that were either taken from early 1970's NASA animation or Russian documentaries from 1969 & 1972 or of a mock-up model or of an illustration. The implications of the analysis published in three parts are so staggering that it once again calls into question, many claims made in the past & still being made in present by Meier, FIGU & the alleged Plejaren on the outer space photos and also on the evidence in general. Let us put together all the relevant conclusions arrived from the various contact reports, as reported under timeline in Part 1 and raise relevant questions. Semjase clearly mentions that they, the Plejaren ETs have been following the development of the joint space venture planned by USA & USSR in the middle of July 1975, since the beginning of the project, which according to NASA is 1970. She even said that they have been influencing this joint project & even at times troubled themselves to make some projects to fail, since the beginning. This automatically implies that the Plejaren among many other things should definitely know the size, color & design of both the Apollo and Soyuz spacecrafts that went up in space and docked on July 1975. Semjase tells Meier to prepare for his longer outer space journey which starts with photographing the Apollo-Soyuz docking on July 17. She even says that the Plejaren ETs - who are 3,500 years(Note:in late 1990's this changed to 8,000 years) ahead of us technologically & have also been responsible for the last 100 years of rapid progress in our science & technology(CR 8, 1975) - have constructed a special apparatus through which Meier could take better pictures. Semjase & Meier observes the interior and exterior of Apollo and Soyuz spacecrafts along with the astronauts & equipment - of which he takes a few photographs. They have also discussed on the size and function of the docking module. The curved edge towards the right of each photo which was visible in most of Great Journey space photos was not seen in the photos which were later developed by Meier. Regarding this, Wendelle seems to suggest that these curved edges were cropped at Meier's end to make them disappear from the image. Meier took at least "a dozen Soyuz-Apollo pictures" (See pg.175, And Stil They Fly, 2004), if not, more than that. And out of these, according to Ptaah, few seem to have been falsified which later got detroyed by Quetzal. 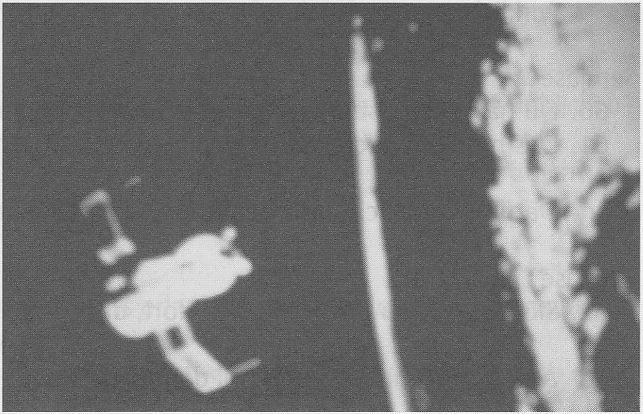 But as you will see in 2002 & 2005 section, that some pictures of Apollo-Soyuz were not falsified or very minutely falsified in a way that these were considered genuine pictures, really photographed by Meier and thereby allowed to be published in PPKBs. 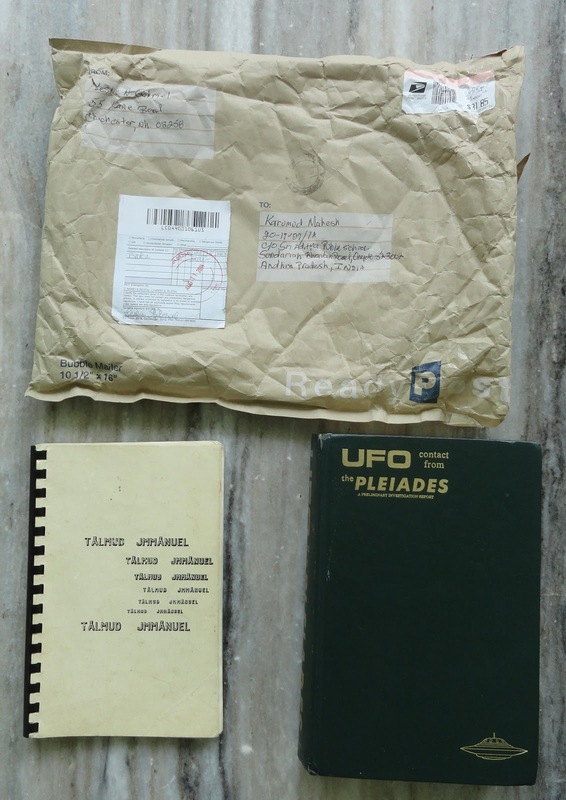 As you can see from the above information, Meier says that the outer space photos that were published in Pleiadian/Plejaren Contact Report vol 1 in 2002 were only some of the total of 42 surviving genuine or almost genuine photos that were really taken by him during his trip in July 1975. And most importantly it was being said that for the publication of these outer space pictures in PPKB 1, Meier took the help of Plejaren ET - Ptaah, who is the commander of the Plejaren spacecraft fleet, who presides over three planets(Earth is one of them) & is also vested with the rank of JHWH, which is comparable to a king of wisdom which in earlier terms was translated as God, not in the sense of creator but as a king of wisdom who has the duty to provide his peoples with help & advice. Ptaah, as we were being told, "strictly ensured" that no more falsified pictures - pictures that were taken of paintings, illustrations, drawings or from TV - would get published in the PPKBs. Even those pictures which were slightly falsified, would be published, if the falsification "found no use", i.e. the falsification did not have any impact on the original photo taken by Meier. Failed to identify the several fake Apollo-Soyuz pictures when they apparently have been following & controlling the development of this project since 1970 ? Failed to identify the several fake Apollo-Soyuz pictures when both Meier & an ET allegedly directly witnessed the real Apollo-Soyuz spacecrafts and their docking ? Failed to identify the fakes when the spacecrafts (Soyuz 4 & Soyuz 5) & space station (Salyut-1) did not even exist anymore during the Great Journey in July 1975, not to mention the fact that these pictures are from Russian space documentaries from the 1969 & 1972 ? Failed for decades to acknowledge the genuine and justified criticism put forth by aerospace experts, a NASA official and other skeptics and critics on several fake pictures? Even after all those years of controversy and genuine criticism, they still concluded around 2002 that 42 space pictures were either genuine or almost genuine when for various reasons at least 11 of them are completely impossible to have been taken in July 1975, and 7 of those are actually from NASA & Russian space documentaries broadcasted in 1969 & the early1970’s? Do not want to respond to any questions/criticism anymore regarding the space pictures and consider this a closed case, as becomes apparent from Contact Report 486 (Jan. 11, 2010), while so many obviously fake space pictures are still present in the FIGU literature that could only discredit the case, even when they already for example had to admit after years of valid criticism that Asket-Nera pictures were fake after all? How could it be possible that the Plejaren, being 3,500 years (during CR 31, July 1975) ahead of us in science and technology, were incapable to construct a device or make adjustments to Meier's camera so that he can take better color photos, as was promised to him (see conclusion #2)? Why did Meier/FIGU remove the curved edge part from his newly printed outer space pictures (especially from Apollo-Soyuz), which according to skeptics and critics resembles the curved edge of a TV (see conclusion #4)? 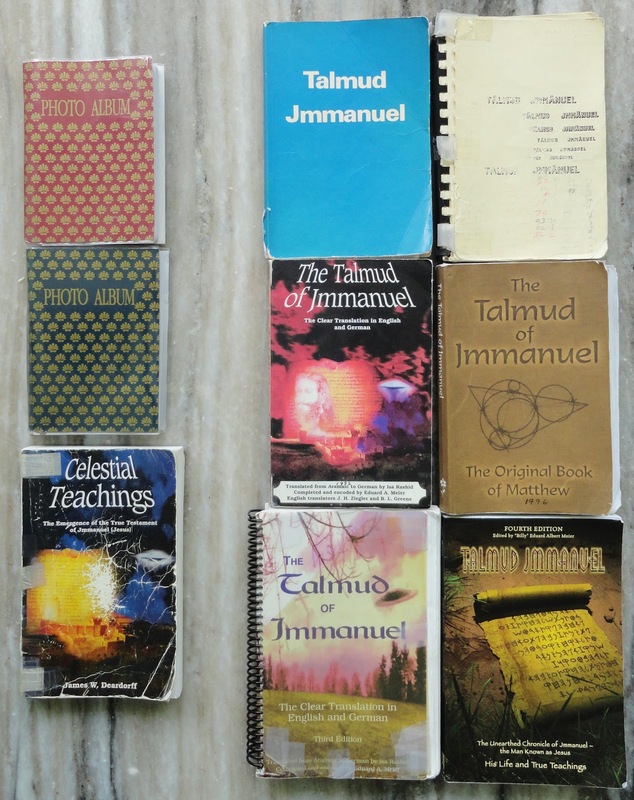 Meier/FIGU's literature contains a lot of information/teaching on truth, knowledge, logic, rationality, cognition & criticism, among many other topics. Yet even when Meier & FIGU responds to critics & skeptics, they seemed to cherry-pick few, often weak points that are easily refuted and focus more on the alleged negative intent of these while the valid points of criticism are completely ignored. An example of this is their critic & "arch-enermy" Kal Korff. Surely he has made some illogical and invalid arguments & also made some personal attacks in his 1981 book - The Meier Incident: The most infamous hoax in Ufology & in his 1995 book - The Billy Meier story: Spaceships of the Pleiades, but at the same time he has also raised a lot of valid & logical criticism (including Apollo-Soyuz & cave men pictures), which were conveniently ignored & virtually absent in FIGU's response (FIGU Bulletin 14, Feb 1998) to his 1995 book. "Typically MUFON: So-called "UFO Specialists" and renowned "UFO Researchers", who truthfully are mere "wannabe glowing stars in the UFO research firmament," allowed themselves to be tricked in every way by two adolescents. The two UFO research luminaries are MUFON Germany associates, Illobrand von Ludwiger and Rolf-Dieter Klein. As we of FIGU have often noticed, it is no wonder that MUFON can be hoodwinked by young and inexperienced rascals, since MUFON is, after all, a "UFO Research Organization", and can only be called this tongue-in-cheek. MUFON, as we all know from past experience, has the idiosyncrasy of being incapable of passing judgment on genuine UFO matters because its specialists are unable to distinguish falsified UFO photos and movie footage from actual, authentic UFO photo and film material. Hence, MUFON continues to habitually declare falsified material as genuine, while assessing authentic UFO pictures, reports, films and other material as being hoaxes. MUFON's incompetence and that of its "UFO researchers" in general or in specific instances, is proven not only by the fact that they label the UFO material as being hoaxy, untrue and fraudulent that I, Billy Meier, have furnished -- even though my material is indeed genuine and my statements are completely true in every way." Meier's comments on MUFON may be true, but Meier/FIGU, even with the help of ET's (who are 30 million years ahead of us in spiritual evolution) and their advanced technology (which is 8,000 years ahead of us), seem to be even more incompetent in distinguishing between genuine and falsified pictures as they have published some of the Meier's outer space pictures as genuine since mid-1970's & also published the rest of the outer space pictures again after "strict" verification by ET-Ptaah around 2002, which in reality are from a NASA animation (despite Meier/FIGU being pointed out about this by aerospace experts, NASA official, skeptics & critics with all details since late 1970's), illustrations, mock-up model & two Russian space documentaries. And if that is not embarrassing enough, Meier/FIGU with the help of ET's also published the supposedly genuine outer space pictures which in reality turned out to be absolutely impossible to be photographed in space in July 1975 since the depicted craft Salyut 4 - Salyut 5 docking & Salyut 1 - did not even exist anymore in space after 1969 & 1971 respectively, and turned out to be from two Russian space documentaries showing nothing but a replica in a simulation and models in an animation of the real craft! Of the investigated 12 pictures, I have identified 11 falsified pictures of which for at least 7 pictures, the source was most likely found; which leaves us with 1 unidentified picture, which certainly does not look like anything that was in space sent by us in July 1975. Is it even possible that a primitive earthling with an internet connection could actually beat ET’s, that are technologically 8,000 years ahead of us? With this track record of Meier/FIGU/Plejaren, are you still certain that the 24 other outer space pictures which were allegedly photographed by Meier, "strictly verified" by ET-Ptaah & published in PPKBs, genuine ? I have done my best to find and present the facts, the conclusion is entirely up to the reader. ..will either somehow reject these conclusions or claim that there were still falsified pictures inserted by MIB (Men In Black) in the Meier collection after all, which was again overlooked by Meier, Guido, FIGU and the Plejaren, as already happened earlier for example with the Asket-Nera pictures. ..will claim this as yet again another example of Meier (or someone behind him) faking his pictures, revealed with concrete evidence. Before I present my analysis of Guido's response to skeptics, let us make a list of all the issues raised by skeptics with Meier's photos along with references to the sources. Look out for the letters - I, G & K - which represents the following. Naturally one would expect that Meier or his group members or supporters - who publish a lot of material on the concepts of logical reasoning, rationality & positive criticism - would address each major objection (valid or invalid) raised by the skeptics since late 1970's. But as far as I know, in any official publication, there was zero response from them until 1991 when Guido for the first time addressed these photos. And how many of these 16 claims so far raised by skeptics do you think Guido or for that matter Meier or anyone from FIGU or supporters, responded officially in these 40 years since 1970's ? However the points being addressed - 1, 2, 3, 4, 6 & 16 - are relatively very minor issues and logically speaking except point 16, the rest doesn't at all make the criticisms made on those respective points, go away or make them invalid. They are still valid & logical. Even the Guido's response to point 16 is absurd and we will get into it later. Apart from Guido, Jereoen Jansen, a Meier case supporter from Holland, published an article online - Analysis of Korff's Spaceships of the Pleiades - in 2003, where he questioned whether the NASA image which Korff used to compare with the Meier's photo in his 1995 book was of a real Soyuz-19 spacecraft or of a model photographed on earth. He also argued that since Korff didn't provide any sources from where Meier could have used the still images from animation, his claims can thus be regarded as unfounded. 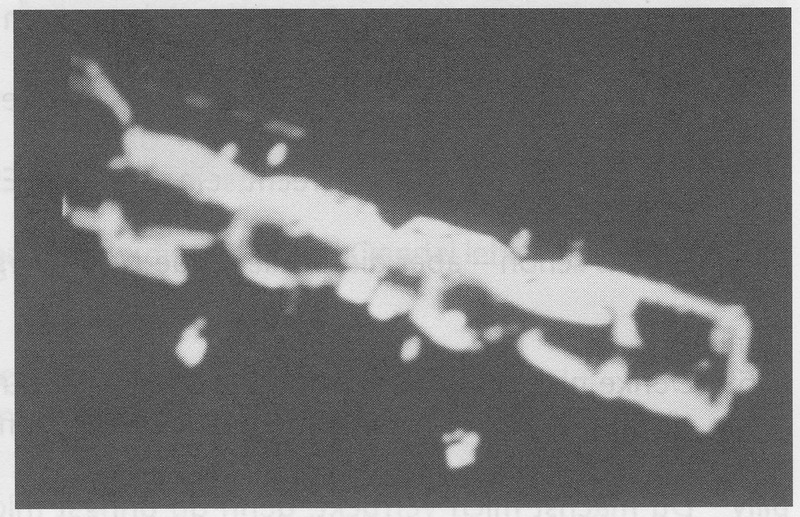 This NASA image of Soyuz-19 taken by Apollo CSM on July 18, is exactly what Korff used on his pg.244 of the 1995 book, which refutes Jansen's argument. And regarding the TV animation about which it was asserted by Korff & all other skeptics that Meier would have used for his hoax but failed to cite, I have succeeded in finding it out. We will get into this later. Before getting into the nuts & bolts of Guido's analysis, first I would like to address a couple of not-so-strong or even invalid arguments raised by the above mentioned skeptics. TVs do not broadcast in 24 fps but in 25 fps." Kal Korff wrongly assumed that the time - 16:30 hrs - as reported by Meier was the time he witnessed the docking of Apollo-Soyuz. A look at CR 31, shows that the Meier was just referring to the time when he was back over Earth after visiting other planets in the solar system. After this, a considerable amount of time passed before he allegedly witnessed the historic Apollo-Soyuz docking. According to this site, the docking of Apollo-Soyuz occurred at 16:09 UTC which in Meier's Swiss time (CET) is 17:09 hrs, which fits into the Meier's description of events. But Korff seems to have incorrectly calculated & arrived at the Swiss time of 19:15 hrs. This same counter-argument was also provided by Jereoen Jansen in his article in 2003. 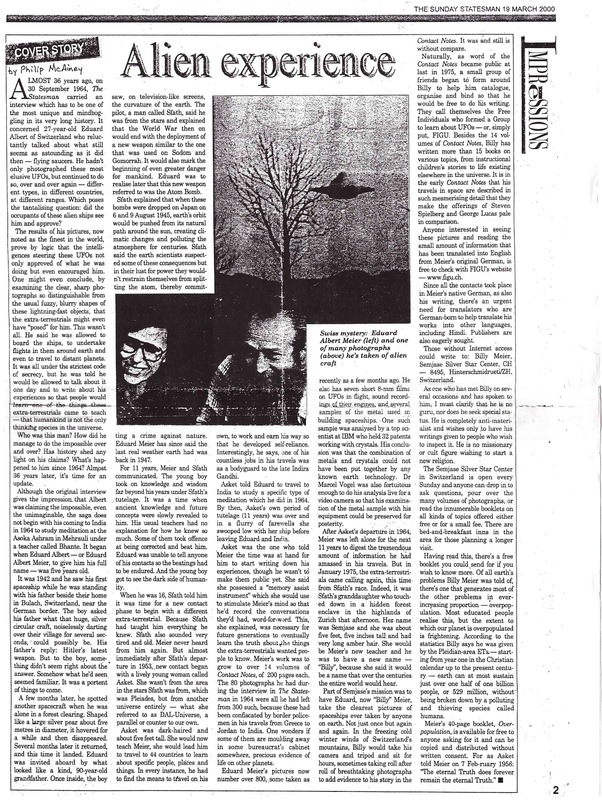 "According to the magazine article, the objections raised by a spacecraft "authority" were based on an "investigation" the authority conducted using NASA material, television pictures and a Billy Meier photo. Now one needed to know, of course, which photo was actually used as a means of comparison ? The range of possible errors is quite extensive, especially with pictures of space. As for my opinion: I am in the fortunate position of having almost a dozen Soyuz-Apollo pictures in my private collection to fall back on...These copies are, therefore quite sufficient to refute the quoted objections, one point after the other." What did Guido argue ? He sarcastically responds to the investigation conducted by a spacecraft expert(s?) using NASA material, TV pictures & one Billy Meier photo, by using double quotations for the words - authority & investigation - and completely disregards and ignores all but one claim (about DM). He then says that this so-called investigation depends upon the type of picture used for comparison as a "range of possible errors is quite extensive, especially with pictures of space". And then "as a good example", he cherry-picks & goes on to address just one of the many serious objections raised by the spacecraft authority (and ignores the criticism from 1980 & 1981), which is about the missing docking module (DM). Even the two pictures(#71 & #72) presented by Guido with having DM are not real and we will get into it later. For all the above claims to be true, the Apollo-Soyuz spacecrafts need to be shape-shifters like the ones in the Transformers movie! Guido says that he has almost a dozen pictures which will refute all the above serious objections "one point after the other", yet he doesn't try to present them in all four different editions of his book - 1991, 2001, 2004 & 2012 - published in a span of more than 2 decades, which raises many doubts on his objectivity & reasoning. An unbiased, open-minded look at a single NASA's Apollo-Soyuz spacecraft image would beyond the shadow of a doubt, reveal that the Meier's pictures as fakes. We shall go into the topic of what went wrong in Part 3 under 'Implications'. Guido has also presented a sketch of a Soyuz spacecraft on pg.175 of his 2004 book, which he apparently hoped would address some of the major objections raised by German magazine, but in reality this move by Guido can't be anymore absurd & it utterly fails. This sketch of a Soyuz spacecraft is from the book - Sowjetische Raumfahrt (1988) - which at a quick glance would more or less resembles the "Soyuz" in Meier's pictures. For some reason he didn't mention or use this sketch to support his arguments. But the context seems to suggest that he presented it to address the points - 9, 12, 13 & 14 - which contains major objections about the huge dissimilarities - configuration & sizes of the solar panels & aerials - between the real Soyuz-19 spacecraft & the one in Meier's pictures. 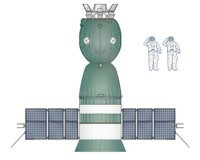 Reason being that the sketch Guido presented belongs to an old Soyuz model (Soyuz 7K-OK) used by USSR between 1967 (Soyuz 1) & 1970 (Soyuz 9) that has no resemblance at all with the real Soyuz 19 spacecraft (that used Soyuz 7K-TM, a variant of Soyuz 7K-T with solar) that docked with Apollo in July 1975. Close observation shows that even Guido's sketch doesn't at all even match with Meier's own pictures. Since the Meier's pictures are of very poor quality, I am unable to list out anymore differences with certainty other than the below three. Guido's sketch has four-segmented solar panels on each side of the service module, where as Meier's seems to have only a two-segmented solar panels on each side. 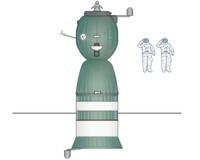 The four segments on each side in the sketch are of equal size, where as in Meier's Soyuz (MS), one of the 2 panels on each side, attached to the service module are small compared to the ones located towards outside. Also the rendezvous radar (see #2) on the top of orbiting module in sketch is missing in MS.
Apart from the already mentioned major differences between MS & real Soyuz (RS) spacecrafts by skeptics, I am listing some other differences which I have noticed. Below points 1 & 2 were cursorily mentioned by Korff in his 1995 book & that is why I am presenting it in more detailed form. See the below 2 color pictures for comparison. Real Soyuz-19 as seen from Apollo CSM. For more images, visit this link. What does it mean ultimately ? It means that the pictures which Meier has been promoting as genuine or almost genuine since 1975 and again strictly verified by ET - Ptaah, are NOT of the real Apollo-Soyuz spacecrafts but could be of models or as strongly suggested by all earlier skeptics & even by William Drews of NASA(see K.1981) that they are from TV, showing NASA animated simulations which was broadcasted all over the world in early 1970's. Some Meier case supporters suggested that finding an animation identical to Meier's pictures of Apollo-Soyuz would be very hard since there was no good software available for NASA to make good animations in early 1970's and that NASA animations of their spacecrafts were done with models & not with a software where as Meier's pictures in contrast looks "very good". But as it turns out the source of Meier's pictures seems to come from a single unedited animation made by NASA simulating the entire Apollo-Soyuz Test Project (ASTP), which was broadcasted all over the world in early 1970's and even was used in recent NASA videos & other documentaries celebrating the historic spaceflight of July 1975, when the world two superpowers USA & USSR co-operated & met in space in the middle of cold war. The primary purpose was as a symbol of the policy of détente that the two superpowers were pursuing at the time, and marked the end of the Space Race between them that began in 1957. I have prepared a youtube video, that contains 6 different clips showing different excerpts that likely belongs to a single unedited-NASA animation, taken from 4 separate educational documentaries. Though I couldn't find the full unedited-NASA animation, these 6 clips are sufficient enough to conclude that the Meier's pictures are 100% fake. Analysing available excerpts from the early 1970's NASA animation & Meier's photographs reveals that Meier's picture #2 from Abstract D of Col. Colman S. von Keviczky's 1980 report was identical to a frame that was part of a NASA animation broadcasted in early 1970's & which again was used in the Russian documentary, aired in the year 2000. Pictures #1 & #3 from Abstract D, 1980 report have the identical structures that are present in Meier's pictures and of course the identical Apollo-Soyuz too, though now moved to a different location because of camera movement; which simply means that these photographs were also made from the same unedited-NASA animation. 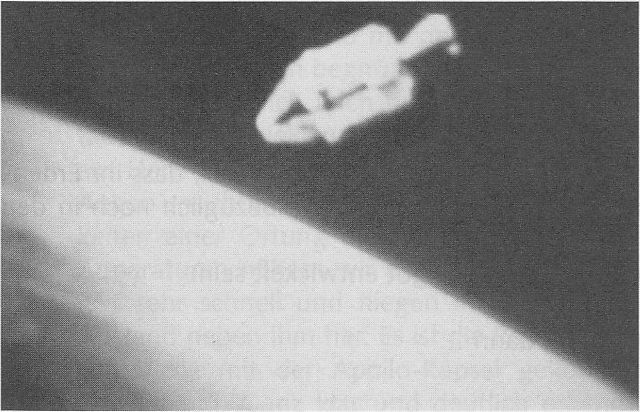 Guido presents photographs #71 & #72 (clearly showing DM) in order to refute the German magazine's argument that the docking module was missing in Meier's pictures. But the obvious fact that Guido ignored is that this DM in Meier's pictures doesn't at all look close to the real DM. Meier's DM has 4-segments with two visible spherical tanks which are supposed to contain nitrogen & oxygen. But the real DM's pressure vessel and external gas tanks were covered with an external insulation cover made of thin Inconel over a multi-layer insulation blanket separated from the vessel by a framework. And that is why we don't see the 4-segmented DM with 2 spherical tanks on each side. The only place where the DM was seen without its cover (apart from the animation) were the illustrations made by artists much before 1975, for example in 1973 & 1974 - March 1973, 1974-01-01, 1974-06-01, and 1974-06-01. But illustrations & likely this animation representing actual DM were made in the year 1975 - April 1975, April 1975, April 1975, May 1975, July 1975, July 1975 and July 17, 1975. The following is a picture of real DM attached to the Apollo CSM (Command & Service Module) as seen from the Soyuz-19. For more close-up images of real DM, visit this link. Some Meier supporters might argue that, Semjase may have made the DM's external insulation blanket transparent. But the already stated overwhelming counter-evidence makes this argument irrelevant & makes no sense. From Guido's book Und sie fliegen doch/And still they fly, I have analysed 5 pictures & have established that neither of these pictures could have been taken from the real Apollo-Soyuz docking, since there are very clear differences between the Apollo, Soyuz 19 and the Docking Module seen in the pictures and their real counterparts. Also I have found one exact match (pic #2) and three (pic #1, pic #3 & #72) as likely part of the same unedited-NASA animation from the early 1970's. Furthermore it is highly likely that picture #71 would also be from the same animation, because the Apollo CSM & the surrounding environment looks very identical to the ones in other pictures. In the next part I will analyse the Apollo-Soyuz & other pictures published in Meier's Contact report 31, PPKB 1, 2002 and the implications of everything so far presented.